I get this question often in classrooms, emails, and workshops. I usually respond with a simple analogy from the days of film, comparing RAW to a film negative, and JPG to a Polaroid print. It's something I've said for a the past 6 years, but it might need some revisiting. Now there is no real comparing a 14-16 bit RAW file to an 8 bit JPG file in terms of information. There is no question that the gamut of colour between those two file types will always be quite different. But much of that is academic to the untrained eye, which begs the question of whether or not the two files warrant much debate. Digital files have certainly come a long way in the past 6 or 7 years. 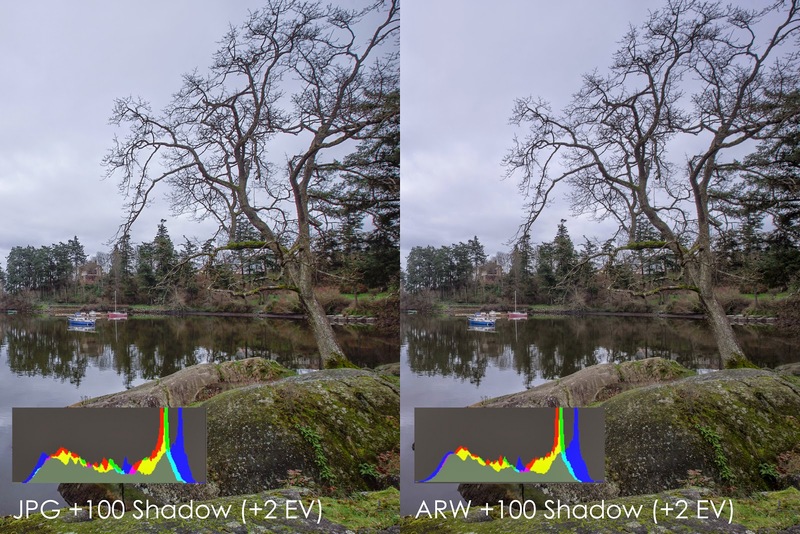 The shadow noise performance of modern digital cameras pretty much now yield near smooth and noiseless images. 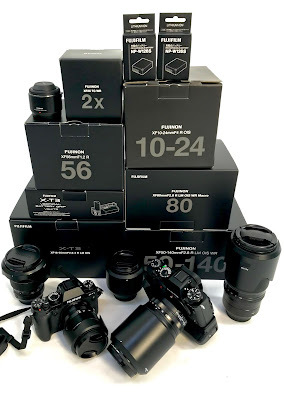 The Sony A7 series of cameras have been the talk of the photographic community for the past year and it produces some amazing images from compressing the shadow and highlight information. I'll say after performing this test, I am very amazed by what the camera puts out, but also what it does for JPG images. 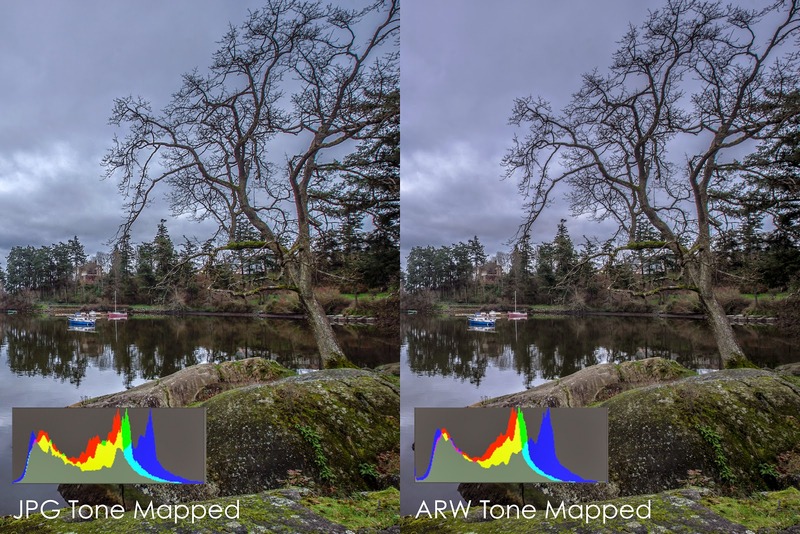 The need for HDR software is certainly put into question, when it appears that the tonal range from 100% black to 100% white produces such favourable results from this camera. Regardless of the tonal range, the shadow noise, and the gamut difference, how much does it matter to the layman. In figure 2, I've compressed both the ARW and the JPG images highlight ranges, with a snap shot to show the histogram. Both histograms look pretty close to each other but there are slight difference that I know from experience that shows the difference in gamut. This image was taken with the Sony A7 Mark II with both RAW and JPG files written simultaneously. The DRO has been turned off and any noise reduction settings (specifically for the purposes of this test. I recommend keeping DRO on and to turn on your noise reduction settings if you use JPG. The camera does a much better job to control those situations, but in this experiment, I wanted to have as much of an untouched/unprocessed file). To preserve highlights during the shot, I carefully monitored the histogram, and adjusted the exposure to ensure there is no highlight clipping (I recommend using the EV dial to underexpose high contrast images if you don't trust your meter). The resulting image in figure 1 appears underexposed, but shadow recovery can compensate for that. Figure 3a shows shadow compression only, and once again we look at the histogram to see any major changes. The JPG does show some minor fall off at the extremes, however looking at the images between the JPG and the ARW, the differences appear pretty minor. In the detailed view (figure 3b) there is very little shadow noise to be concerned about considering that the shadow was compressed by +2 EV. There is some detail loss that you can see in the form of JPG artifacts, but it is both a result of compression and in camera processing. Turning up the sharpness in the in camera profile certainly should compensate for that (something you'd normally have to do in post with RAW files). In the Figure 4 example, I've combined both shadow and highlight compression. Both histograms show subtle differences, but both the shadow and highlights are now compressed to simultaneously show both extremes. Again, much of the image differences are subjective, and in some ways the micro contrast of the JPG might be even slightly better but all things treated fairly, looking at the histogram at this point I'm observing the differences between 8 bit files and 16 bit files. But at the end of the day does it really matter much? One thing that needed to be adjusted was White Balance, and because JPG files cook the colours in, this was much harder to adjust between the two files (however as in the figure 4, the RAW file went magenta but was easily corrected). RAW was easier to match to the JPG file because there is more colour information. This means while using JPG, you need to make sure your white balance is set properly ahead of time. Even with the 8 bit JPG files, I was able to push it at least 4 stops, which in the past was lucky to get 1.5 stops. I also did some more tests where I pushed it 6 additional stops overall, giving a very healthy margin of 12-14 stops as reported by other sites. Although the low overall gamut of the JPG image may present some banding issues with certain images and certain colours, it doesn't mean that it should be totally disregarded as the ugly step child in your camera. Based on this simple test, it isn't as clear as it was 6-7 years ago about the differences between the two formats. I might have to change my analogy to something a little better suited to today's generation and a little more accurate. RAW is like the graphics of the Sony Playstation 3 compared to JPG images as if it were on the Sony Playstation 2. The real question for many is should they shoot in RAW or should they shoot in JPG. My answer to that is yes! For the most part it is pretty inconsequential. I use both when the occasion calls for it, and when I do need to shoot thousands of images (most of the running events I shoot are all in JPG and usually I shoot 4000-5000 images per event). I find that if the situations is controlled and I have time to set things ahead of time, I shoot JPG. But if I'm uncertain of changing light or going to be changing settings a lot, I still trust in RAW files. This test proves to me that I can trust in both formats regardless of my personal preference, and probably should be less about RAW vs JPG in the future, and more about how to shoot both to maximize the most potential from it. 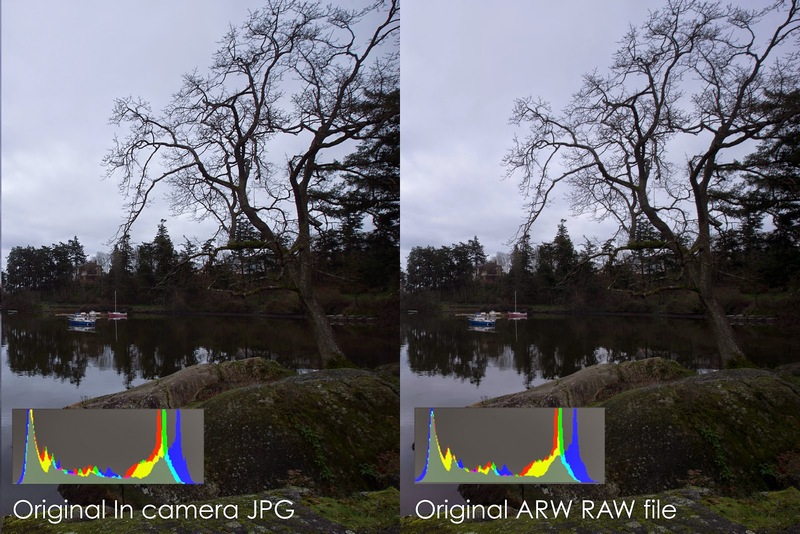 Post Script: One comment I received are other important factors of why to shoot raw which in terms of problematic files that are harder to correct in JPG images are colour balance, post sharpening, and noise control (especially in higher ISO images). RAW files offer much more flexibility in terms of this. But this article isn't to suggest that RAW is a crutch, but there is no doubt more information is always better. 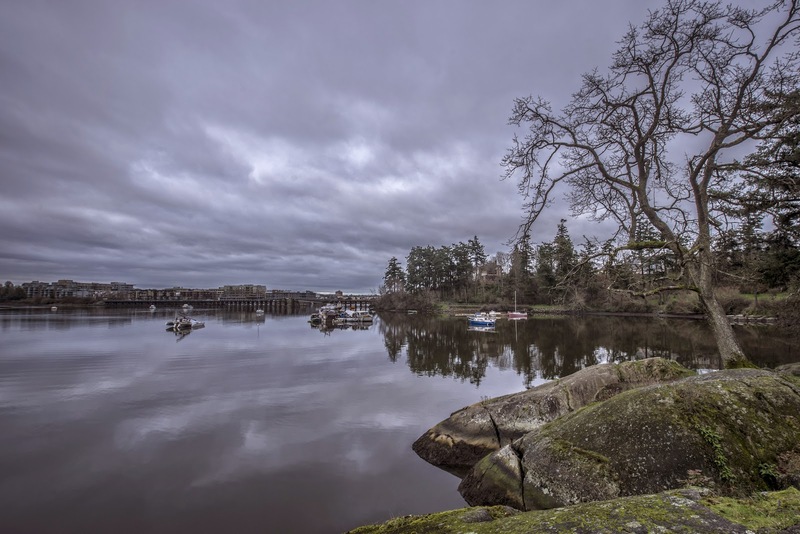 I would never do shadow and highlight recovery to a JPG image like I have done here, but this article merely demonstrates what flexibility is still within the JPG file without resorting to a RAW file. JPG does require accurate and proper settings to maximize the file, which means that if something does go wrong, you can always rely on RAW files. Like many other cameras, having the ability to shoot both RAW+JPG is actually a good compromise to the question. If you choose to save yourself a bunch of work, you can just use the JPG files. RAW or JPG? It doesn't really matter because they both look the same. Thank you for your comments, I've added my thoughts to your link on dpreview. Please read the article through and I believe you'll understand better the points I'm making. There is nothing misguided here, only opinion and observation. Great article. The only thing I'd disagree with is the conclusion. "If you choose to save yourself a bunch of work, you can just use the JPG files." RAW files aren't necessarily any more work than JPEGs. Thanks. I don't necessarily think that experienced users will find it that much harder either. Really does depend on your workflow. 5000 photos, you can do an automatic adjustment and preset and be done with it as well RAW or JPG. I found article very interesting. Others seem to think of this as some kind of blasphemy almost. I guess you have to have guts to even suggest something like this. Anyway, we'll do Everything!